Chicken is a staple in my kitchen. I’m guaranteed to always have some on hand. Whether it’s chicken thighs, a whole chicken, or even a rotisserie chicken. Any of them hold so many delicious possibilities for me. Chicken breasts specifically hold a special place in my heart. Those I make sure I never run out of, and the 1 or 2 times I have over the years- well that calls for a state of emergency in my home. They could be going in my smoker as this Maple Chipotle version, or as the ever tasty Sweet Heat Bacon Wrapped version. Pretty recently, that’s been the way we’ve been almost exclusively enjoying them. Honestly, you really can’t go wrong with throwing your chicken in a smoker. You also can’t go wrong by going a different route completely. In the oven, on the stove top. 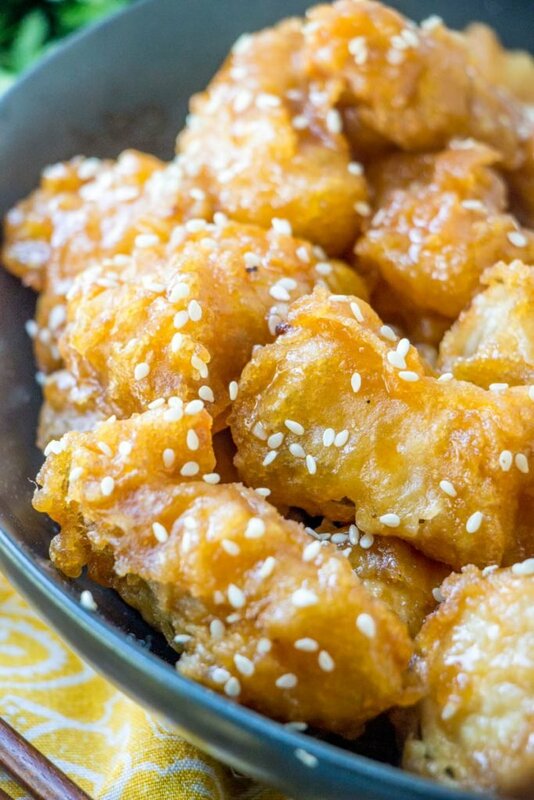 Or my particular favorite, fried and tossed in a savory sauce. 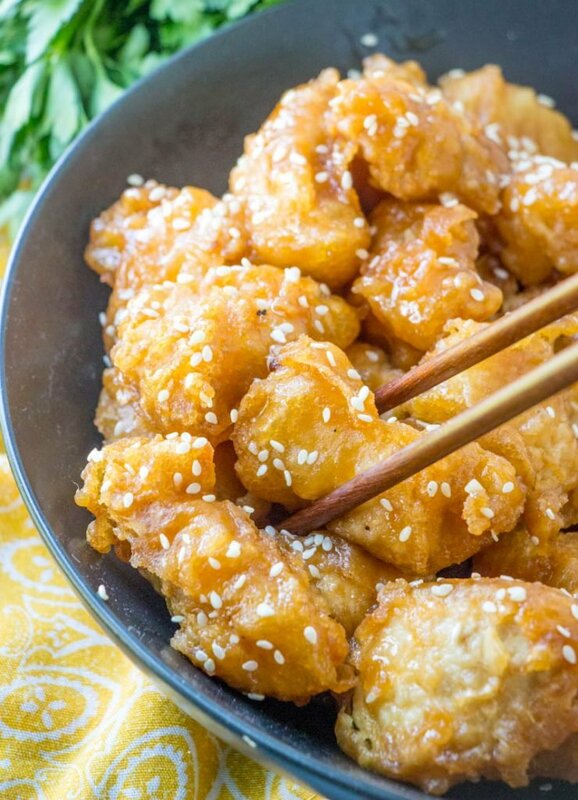 Not many cuisine’s do this particular style of chicken better than Asian American cuisine. No this isn’t authentic Asian cuisine, or even Chinese- despite it being served at a number of Chinese restaurants. It is amazing though. 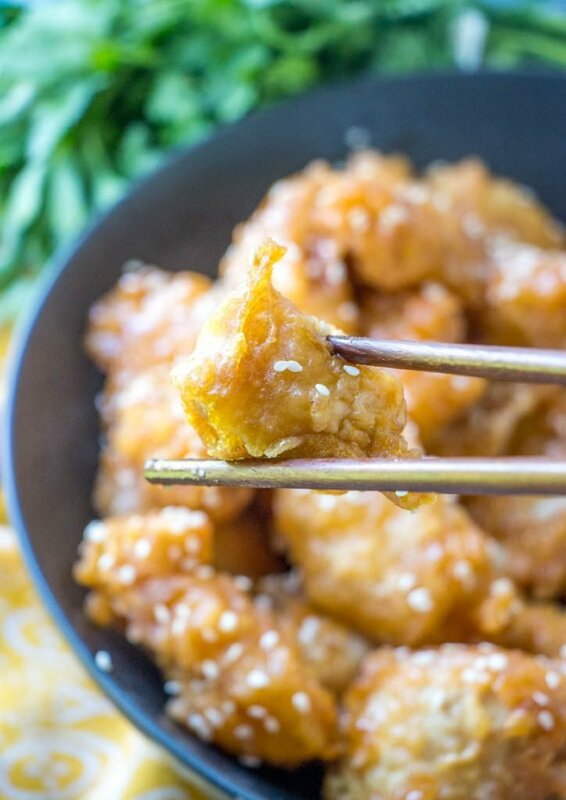 I’m sure you’ve heard Orange Chicken or the equally popular General Tso’s chicken, but have you heard of Honey Chicken? If you haven’t, then by all means let me tell ya- you’ve been missing out! So let’s rectify that situation with the rest of this post. This recipe is easy enough for any level of adult cook, because obviously we wouldn’t recommend mixing children and hot oil. That requires a level of caution I’m still not sure even my oldest boys have yet. First you dredge the chicken chunks in the batter, let the excess drip off, and then add to the hot oil, frying until golden brown. Test a piece once they’re golden brown by cutting it open to make sure the chicken is cooked even in the center. Using a slotted spoon, transfer the crispy chicken pieces to a paper towel lined plate to drain off/soak up any excess grease. Once the chicken’s done, we’re gonna get serious about whipping up our sweet & savory honey sauce. This is a mixture of savory and sweet, seasoned with ginger and garlic, and thickened with a cornstarch & water slurry. Once the sauce is done, add the chicken to the pan, and toss to coat. You shouldn’t have any trouble getting this sauce to stick. 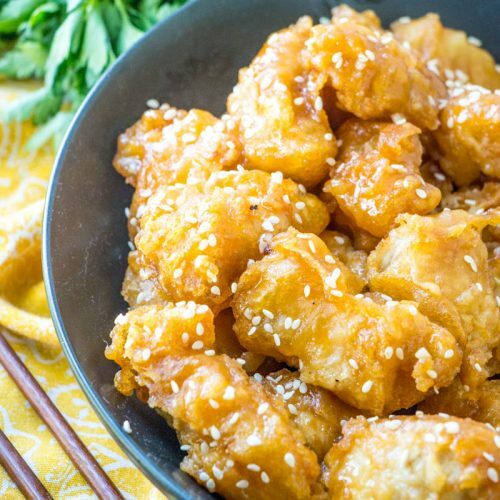 If you’re looking to get your take out fix at home, look no farther than this Asian Style Crispy Honey Chicken. There’s literally no better, or tastier, way to use those chicken breasts you’ve got lyin’ around. 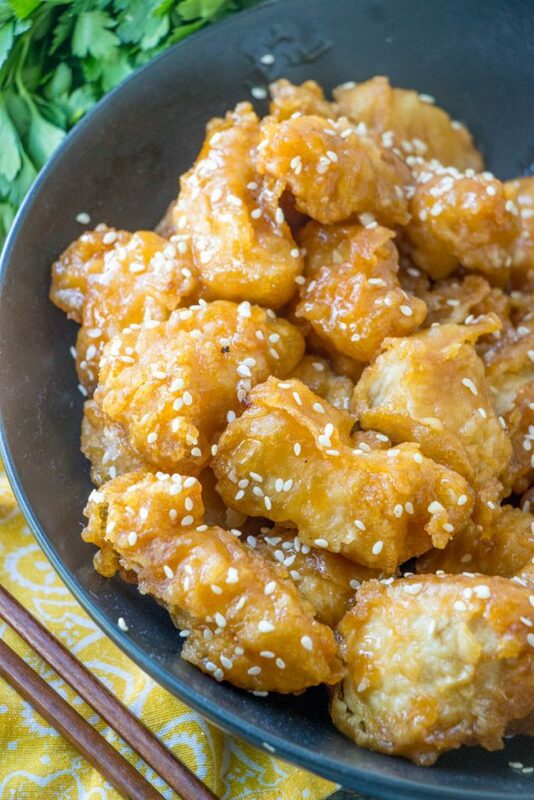 Serve them over a bed of white rice for a filling meal the whole family will love. Other Asian Style Recipes You Might Also Enjoy: Mongolian Barbecue Burgers with Asian Slaw, Asian Chicken Noodle Soup, Asian Cucumber Salad, Crispy Asian Glazed Brussels Sprouts, & Asian Style Chicken Spinach Pasta Salad. 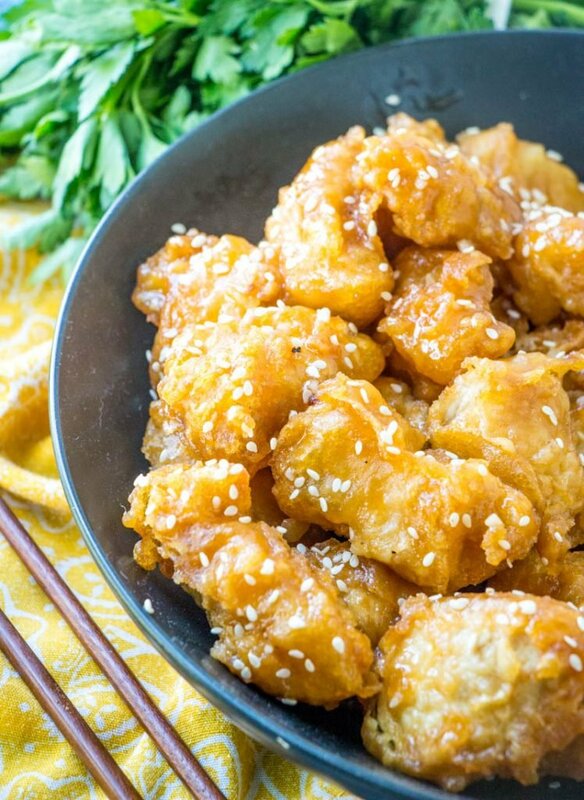 Battered pieces of chicken are fried crisp, and tossed in a sweet yet savory honey-flavored Asian-style sauce for a seriously delicious meal when served on a bed of white rice. Mix all batter ingredients together and whisk until smooth. Dredge your chicken pieces in the batter and fry until golden brown on the outside, and the chicken's cooked through. Remove with a slotted spoon to a paper towel lined plate. Meanwhile to make your sauce in saute pan add oil, ginger and garlic and saute until fragrant. Add in salt, honey, vinegar and water and stir well to combined. Mix together your cornstarch and water and pour into sauce and whisk for a few minutes until thickened. Add your chicken and toss. Chicken is a staple in my kitchen as well and your recpie with honey sounds delicious! What a stunner recipe! I like the use of self rising flour in the batter. Thank you for sharing such a fantastic recipe at Fiesta Friday. I’m sure everyone at FF will love it.